On Monday, we read our editor Ashley Johnson’s glowing review of Terra’s Kitchen in the first segment of our three-part food delivery review series. Today, our fellow writer (and food-blogging mama!) Meaghan Dawson tried out Dinnerly with her busy family. Keep on reading to learn her thoughts about this service! Knowing this about me, you might be wondering why a food blogger would even need a meal box service. Isn’t it my job to cook from scratch and create recipes and do all the food things on my own? Well, technically, yes. But also, no. Because on top of being a food blogger and a major foodie, I’m also a mom. A busy mom, in fact. I’m stuck smack dab in the phase of parenting where my kids can’t drive, yet somehow need to be chauffeured all over town to their plethora of different activities every single afternoon. I’m basically an Uber driver who drives a filthy car that smells like basketball shoes and doesn’t get paid. This means, in short, that our afternoons are chaos. And for this tired mom, no matter how much I love to create recipes and be healthy and creative in the kitchen on the daily, I just don’t have it in me. When we roll in the door from all of our activities each night, I’m usually exhausted and my kids are starving and no one is in any mood to be experimenting in the kitchen. And this, my friends, is why meal boxes are this mom’s dinnertime dream. When it was time to write this article and explore Dinnerly, a meal box company I was previously unfamiliar with, I was all in. Everything about the article, the concept, and Dinnerly itself was screaming my name. Why does a food blogger need a meal box service? Because on top of being a food blogger and a major foodie, I’m also a mom. A busy mom, in fact. 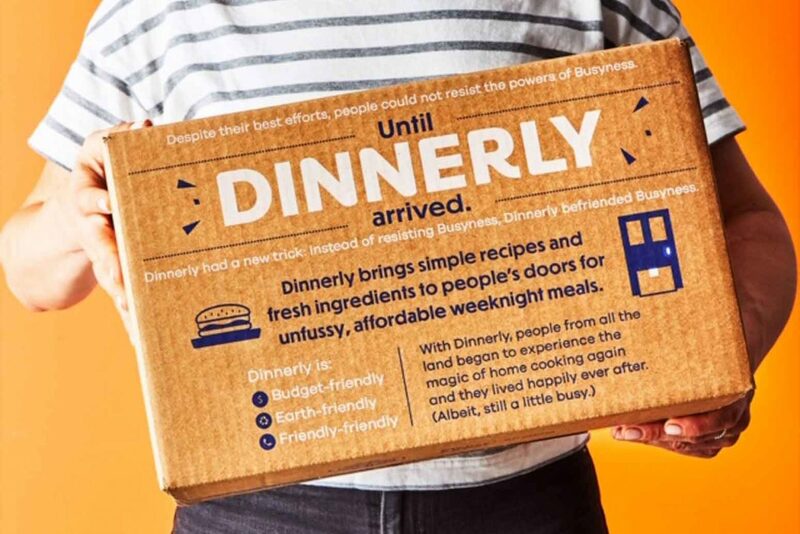 For starters, Dinnerly is marketed as “Affordable, Easy and Unfussy Meals.” If that isn’t a motto that speaks right to my heart I don’t know what is. And I learned very quickly it is all entirely true—no fluff, no marketing magic, just truth. At $4.99 a serving, these meals are the most affordable meal box I have found, and for a family on a budget that’s very important. They keep their costs low by eliminating waste—not sacrificing quality. The recipes are sent as links, not costly print-outs and they are simple, ditching large ingredient lists and complicated steps for a few high-quality ingredients, simple instructions and delicious results. I chose three very kid-friendly meals—spaghetti with meat sauce, pan seared chicken with mashed potatoes, and burgers with (get this) homemade onion rings. Let me tell you: all three were a huge hit at our table. The spaghetti was a one-pan meal, which is key for someone who abhors doing the dishes, and the easy-to-follow steps made it a breeze to throw together. The best part, though, was how much it made—even after my family of five had their fill I still had leftovers for lunch the next day. From my experience with meal boxes, this is rare. There are almost never leftovers and at times I even find myself supplementing with side dishes from my own kitchen to make sure we all have enough to eat (read: more work for me that I’d prefer not to do). Our second meal, the pan seared chicken, was a surprise hit. Not only did I learn a few things (like how using the potato cooking water in the mashed potatoes is a genius move producing delicious results), but the five-minute gravy had even my pickiest eater devouring the broccoli. And if that is not a dinnertime miracle I do not know what is. I’m confident I’ll be using both of these techniques in the future and I know this is a recipe I can re-create on my own later. I chose three very kid-friendly Dinnerly meals—and let me tell you: all three were a huge hit at our table. And finally, the burgers. What’s not to love? My kids have oddly never had onion rings. I know, I know. Major parent fail on my part. But that didn’t stop them from devouring this version. They were in crispy onion heaven and have since requested them multiple times. The burgers were juicy, tender, and everyone loved them. All in all, Dinnerly might be my favorite family meal box service. The value is undeniable. The meals are unfussy, the recipes are easy to follow, and the results, well, they are delicious. I have some picky eaters and all three of these meals were raving successes—which is a big deal and a rare occurrence, even with my own recipes. If time is short and dinners are hard, this just might be the perfect family meal box for you. I am definitely in the Dinnerly fan club and can’t wait to get my next box. Interested in trying Dinnerly out and want to get a fabulous deal courtesy of Dinnerly and Grit and Grace? Use the code GRITANDGRACE for free shipping on your first box. We know you’ll love it as much as we did! Our third and final food delivery service review can be read here: a comprehensive look at top boxes on the market! Ask Dr. Zoe – Is It Wrong for a Married Mom to Want More Time With Friends?